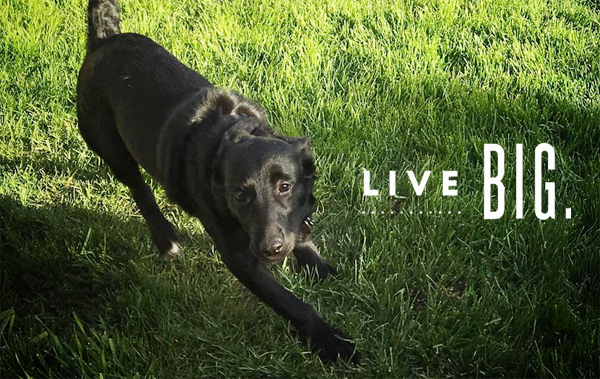 Live Big: New Food Station and @PurinaCanada Food for Storm. When Storm first came into our lives in early 2016, she was only 9 weeks old. We wanted to make sure she had all of her own things. Her own feeding station (food and water bowls), a few new beds, new toys, a new crate, and a new leash. Things that Storm could call her own. This allowed us to treasure Dakota’s time with us, and start new with Storm. I still haven’t brought myself to take Dakota’s leash off the leash hook by our garage door, or sell her extra large crate. In time. Storm’s first food and water bowl was something we bought in a hurry. The night we brought her home, we gave her food and water from one of our bowls. She was so tiny. The next day, I went out and bought her a small feeder station (food and water bowl), 3 new beds, several toys, and a new crate. That crate lasted about 3 months before she outgrew it, and we had to buy the next size up. Storm did this really funny thing… when she was hungry, she would go grab one of the metal bowls from her feeder, and bring it over to us and howl with the bowl still in her mouth. She stopped doing that around 5 months old. The feeding station we bought her was fine, but when we increased the amount of food we were giving her, she started to carry the food all over the kitchen, and spill around her bowls. She’s not exactly a neat eater! It was time for a new bowl. A larger one. Something that would keep the food in the bowl, and allow her to have more food and water. As well, we needed to get her eating Purina food… but which one? We decided to rotate between two foods, so that Storm gets a variety. The foods we chose are: Purina Pro Plan Savor Shredded Blend Chicken and Rice Formula (Hard kibble combined with tender, shredded pieces for delicious taste and texture), and Purina ONE SmartBlend True Instinct Formula With Real Turkey & Venison (Crunchy protein-packed pieces and tender meaty morsels, deliver outstanding taste and high-quality nutrition). Rachel and I went to our local pet store to look at new bowls for Storm. We wanted something that was larger, but would also contain the spilled food and water. The Neater Feeder was the perfect size, and had a catch-all for anything Storm spills. Of course, that won’t stop her from carrying her food away and eating it elsewhere. While at the pet store, we looked at new air-tight food containers. As we would be using 2 different kinds of food, we wanted to keep them separate, without keeping open bags. As well, we wanted another container for Storm’s various treats. We found these Top Paw air-tight food containers in 25lb and 10lb. We picked up 2 25lb containers (for her food), and one 10lb container (for her treats). With my background in marketing and graphic design, I just had to personalize Storm’s new feeding station. Because we were emptying her food directly into the container, and disposing of the bags, we needed a way to identify what for was in which container (preferably without opening the container). So I printed out labels that I attached with reusable glue dots. One label for the Purina Pro Plan Savor Shredded Blend, and one label for the Purina ONE SmartBlend True Instinct Formula. Then, I added the “Stand Back: There’s a Storm coming through” logo I created for Storm to each container. Well here it is – Storm’s new feeding station! She loves it, which is the only important thing. But, it also looks good. With her station being in our kitchen, I wanted to make it not only inviting for her, but also not a hot mess for us and guests in our house to look at. I think this will be a pretty cool conversation piece when people see it!